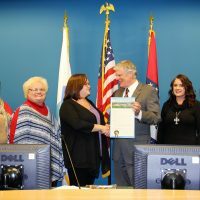 HOT SPRINGS – Members of the 52-year-old Hot Springs Women’s Chamber of Commerce recently dedicated Mayor Pat McCabe’s proclamation designating National Business Women’s Week to 33-year Women’s Chamber member Janie Evins. The proclamation was recently presented by District Five City Director and Women’s Chamber member Karen Garcia. From left: Karen Kitchens, Regions Bank; Garcia; Carrie Gage, Hot Springs School District; Jeani Fisher, Ulta Beauty; and District Three City Director Becca Clark. Not pictured are Eleanor Sherfield, Arbonne International and Cora Jones, S&S Carwash.